StumbleUpon is a social Link sharing site. If you are an information seeker like me, but are tired of searching google for finding interesting site, then worry no more, StumbleUpon will help you discover and share great websites. The coolest thing about StumbleUpon is that, with just a click of a button you will be taken to an interesting site from the list of categories that you choose. And trust me its quite addictive. The StumbleUpon toolbar is a must to have in your browser. If you dont have it, you are missing some fun of internet. Apart from using StumbleUpon for surfing, you can also use to meet like minded people. StumbleUpon is also cool, if you want to surf through the numerous videos that have started flooding on the website due to the popular emergence of social video sharing sites like youtube and googlevideo. Sketch Up as defined by its official website.. The software is definitely easier to use then other 3d modeling softwares available in the market. The most amazing thing about the software is that one can design a whole city with the help of just rectangle , polygon and a curve drawing tool and a pencil, one just has to show an artistic touch while pulling or pushing from specific locations( which is the crux of this software) like pulling small part outside from a rectangular wall to depict as the fins of the window or removing small parts from a wall to depict doorr or windows and many many things could be done in a similar fashion. 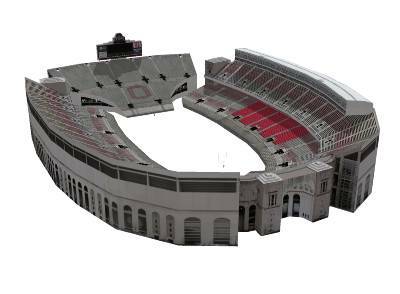 One can see the image of a stadium generated by this software.